This book takes on a specific challenge: "We all, Muslims and non-Muslims alike, have a choice. Either we allow our fears to bear us along towards what could eventually become a war of apocalyptic dimensions. Or we can rouse ourselves from our fearful obsessions and search for ways not only to reverse this negative trend but also, and most importantly, to focus the world's energies on achieving peace and human flourishing" (from the Preface). 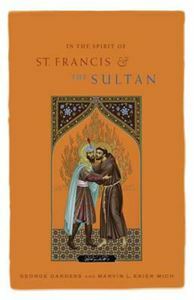 Taking up the story of the peaceful encounter between St. Francis of Assisi and Sultan Malek al-Kamil, the authors attempt to increase understanding between Christians and Muslims and to demonstrate how Christians and Muslims can work together for social justice. Basic tenets of both Christians and Muslims are described using clear, accessible language intended for general readers. After demonstrating how both the Bible and Qur'an call for actions that promote the common good and love of neighbor, Dardess and Mich suggest practical ways for Muslims and Chrstians to come together to implement specific programs of social justice.